Marginalized groups are being left behind and remain unheard in public finance. More than 30 million Filipinos living below the poverty line have no capacity to participate in public finance; establish partnerships with government officials; and follow the cycle from policy proposal to approval, implementation to accountability. There is also lack of awareness and appreciation among local officials on the significance of peoples' participation in budgeting. The project “Institutionalizing Marginalized Communities’ Participation in the Philippine Budget Process” aims to achieve increased participation of marginalized sectors -- women, indigenous people, lowland farmers, coconut farmers, small fishers, fishers in marine protected areas, urban poor, people in displaced communities and Muslims/ Moro -- in the local and national budget processes in the Philippines. This intervention covers the coconut farming communities in Baao, Camarines Sur; rice and vegetable farming communities in Guimba, Nueva Ecija; urban poor communities in Tondo, Manila and Quezon City; small fishers’ communities in Hinigaran, Negros Occidental; fishers’ communities in marine protected areas in Dauin, Negros Oriental; Moro communities in Tulunan, North Cotabato; and Indigenous Peoples' communities in Magpet, North Cotabato. Under this program, vulnerable sectors proposed budget proposals that they will present and lobby for adoption in the local budget. Through joint efforts, the Local Government Units working with the marginalized communities and the local civil society groups will be able to come up with a people’s participation mechanism that is apt to the local culture and systems. This project will also amplify the voices of the marginalized through media advocacy and budget advocacy at the national level. They will be partners in pushing for budget reforms, people’s participation, transparency and accountability in the country’s budget process through linkages and their partnership with the Committee on People’s Participation at the House of Representatives, the legislators pushing for budget reforms as well as civil society groups advocating for increased allocation for critical socioeconomic services in the national budget. Women’s empowerment in budgeting is a prerequisite to a genuinely democratic, responsive and effective government budget. The alliances formed through the project will work towards societies where the budget effectively addresses the marginalization of women. Social Watch Philippines and the La Liga Policy Institute implemented Cementing Pathways to Financing the MDGs in three municipalities in Negros Oriental – Sibulan, Dauin and La Libertad. This focus on building partnerships among the local government units (LGU) and the local citizens’ groups on building plans and budgets to accelerate MDG achievement in the communities. The Indigenous Peoples (IP) Communities are among the most vulnerable sectors in the Philippines. Many civil society organizations already focused efforts on Philippine IP communities; empowering them through basic and political education, environmental protection, entrepreneurship and microfinance projects. Many outreach programs were already implemented so that they can have better homes, access to healthcare, and get better nutrition. Yet, the missing link, which will make all efforts for better education, livelihood, health and infrastructures sustainable for the indigenous people is to institutionalize mechanisms that will ensure that local governments consult and include the IPs in drafting and implementing the budget for IP communities. Empower Indigenous Peoples’ groups by helping them understand the budget process and push for alternative budget proposals in the national and local budgets. 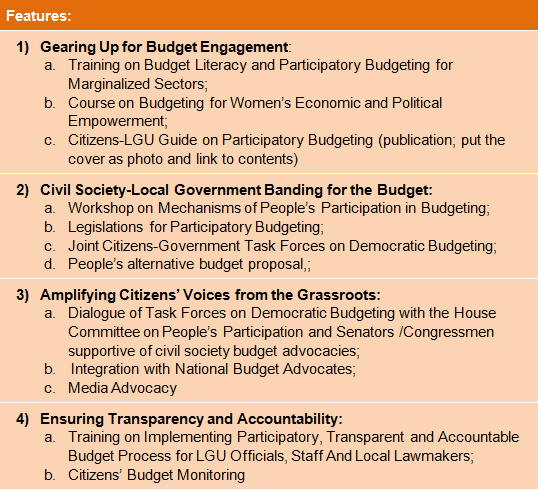 Initiate mechanisms for indigenous people’s participation in budgeting at the local level. Promote respect, preservation and protection of the IP ways of life by making the budget process an arena where IPs can directly influence development priorities in their communities so that their special needs and requirements are highly considered in the local budget. The territory of public finance is not open to citizens and considered sacred by government. SWP saw that governance is much too big an issue to be left to Government alone. Hence, it pushed for participatory governance, which gets to the heart of that sacred territory which is Peso. Citizens should not be simply concerned about budgets. They should also be concerned on revenue, accounting and the whole range of public finance. They should account every peso taken from the citizens and where it is spent. SWP-UNICEF’s Capacity Building Program on Public Finance and People’s Participation is a strategyto improve capacity in participatory public finance -- not only among the stewards of public money (LGU) – but in every citizen who should have a say on how taxpayers’ money is being used by government. Training workshops were held 36 municipalities/ cities throughout the country. UNICEF recognizes that improving health of mothers and children is related to everything in a systemic way; and that maternal mortality and infant mortality are related to schooling, poverty, the environment and everything else. The program aims to deliver its commitments to the most vulnerable, which are the children.